Bette Midler took to Twitter to sound off on all the molestation allegations that 19 Kids and Counting’s Josh Duggar is facing. The 69-year-old singer wrote on May 25: “Josh Duggar resigned from an anti-gay <<family>> group due to molestation allegations. 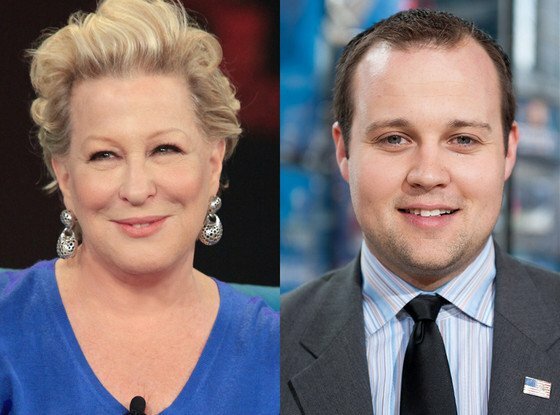 Bette Midler isn’t the first celebrity to give an opinion of the shocking Josh Duggar controversy. After the 19 Kids and Counting star released an apology statement last week, Arkansas governor Mike Huckabee voiced his support for the Duggar family. Meanwhile, Montel Williams went on a Twitter rant attacking the Duggars and the Family Research Council, the conservative group where Josh Duggar worked.